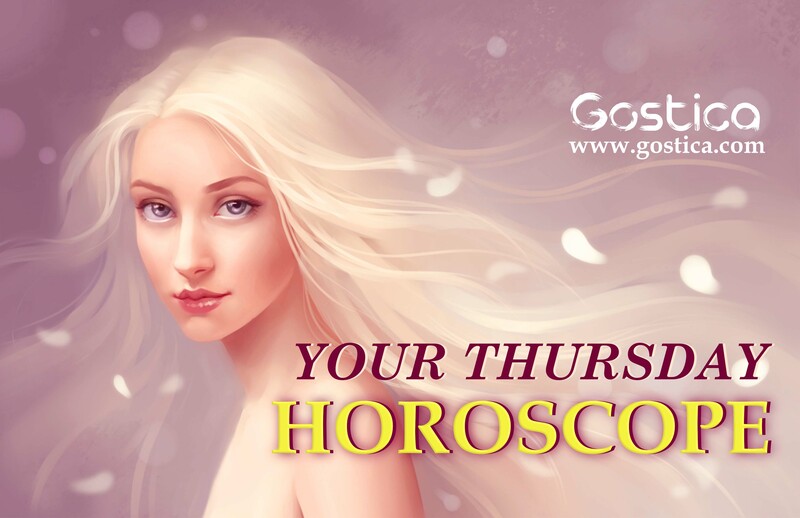 Read GOSTICA’s Daily Horoscope for each Zodiac Sign. Voted the Best Horoscope. Over 500.000 readers. On Thursday, events and people will help you find the best solution of the problems that have created moments of panic for you in recent days. Most likely, they will have a domestic or property nature. An unpleasant argument with a man from your circle of friends or acquaintances will challenge you emotionally, because of the awareness that it could have been avoided. This day, you will want to find out more about an event from your recent past, the development of which is a mystery to you. Some of you will have an occasion to gather in your home related to a girl or a young woman. LOVE: An interesting development today will involve a flirt or a love affair at your workplace (if you have one). Today you can talk to your love partner about important future family-related plans. If you were born under the sign of Aries, Leo or Sagittarius, today’s priority will be to solve your home problems. It is possible to have contacts with people or institutions related to different cases that you have with the type of property you own. Try to avoid conflict in your home. If you were born under the sign of Taurus, Virgo or Capricorn, you may be angry or intrigued today. It would be good to avoid conflicts or malicious people. Generally today, you will have a successful and productive day, so focus your attention on important daily tasks in your home and work. Today there will be new opportunities for developing your affairs or for achieving important success. If you were born under the sign of Gemini, Libra or Aquarius, today’s events will show you that you need to take control of the important things in your life. Your greater engagement in work should not negatively affect your family affairs. The day indicates an important conversation or event related to a woman from your circle of friends. If you were born under the sign of Cancer, Scorpio or Pisces, on Thursday, use opportunities for constructive deeds. Today you will experience some nice moments related to a girl or a young woman. You will have interesting dreams that you will try to unravel. On Thursday, avoid bad words or insults. You will meet a person on the street today, who may bother you or make you nervous, but you don’t have to tell them about it. It’s much better to keep going and stop thinking about it. You probably don’t need to see them anymore. On the contrary, if you get too excited about their mistakes, their defects, know that they will have to do the same with you. In short, if you don’t want to be pinched in real life, avoid pinching others. Gather your thoughts and try to find a unanimous idea about what is happening in your professional life. After all, you can’t help but question what’s going on. Perhaps in the past you have had some qualms about your abilities, but now you can no longer have them. You are quite ready to face all that is at stake and you have to follow a well-defined path. You can not always risk receiving criticism of your work. It would be more appropriate to try to give convincing explanations to your current behavior. You have some worries, but this should not stop you nor should it afflict you. So you can’t always understand them especially when you behave abnormally than usual without an apparent and valid reason. Try to regain all your energy today. You have your own methods to recharge yourself; to release tension and return being happy and smiling, so put them into practice without even thinking about it too much. If you want to cheer yourself up, you can’t feel guilty about those who don’t want to. We are all different and we all choose how to react. But reacting positively is better! If you don’t have any tasks established at this time, it doesn’t mean you can’t find one. Instead of staying with your hands, you should choose an imaginative way to occupy your time. Give yourself better opportunities to grow and enrich your experiences more and more. You can still do a lot. In fact, you have not yet started your climb! You need to have more self-confidence. You are finding it increasingly difficult to express your feelings, although there are no objective obstacles to stopping you. You simply have to go to the person in question, who is causing you riots, and talk about it. You are not very used to confrontation. You often deny and avoid it because you’re afraid that they will tell clearly in your face how they feel about you. You’re afraid that they have read you inside and you can’t accept it, even though it is a positive thing.